First I am looking back on my experience with Obstacle Runs last year, where I dramatically improved my time. Then I am customizing what worked for the unique element of having Zombies trying to eat my brain …. capture my flags. This morning I set up a race training with MiCoach, they have a wonderful app for Android & iPhones, where I progress gradually over the next 11 weeks. I scheduled it to do 3 days a week, picking Monday, Thursday & Saturday for my days. Within MiCoach I’ve made myself some runs that will randomly tell me to sprint. Over the next 11 weeks I’ll increase the protein & diary I consume, and reduce carbohydrates, especially non-fruit sugars. It worked well last time & I am still lighter than before I started shifting my eating habits, even though I have been eating more since the holidays. I already have a few people who we plan on doing this together. It’s our first, and for many it’s their first obstacle run. If I ever want to do it for time, it’ll be a future run. This time the focus is fun, completion & survival – in that order. P.S. 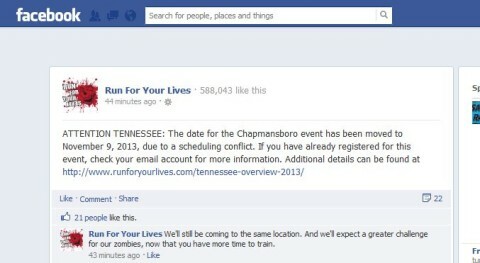 Can’t make this run … I’m doing at least one more in 2013. Planning now. Let me know your interest & I’ll include you in discussions. 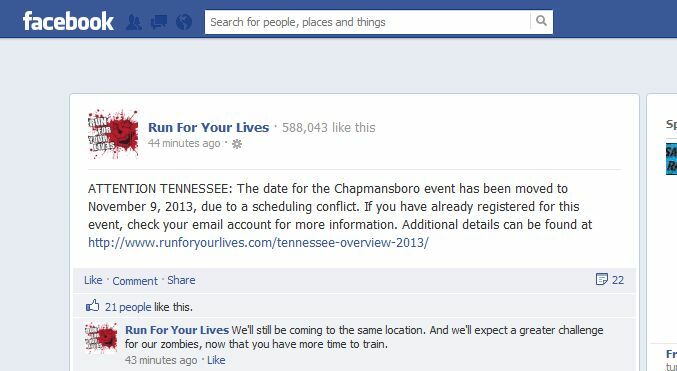 All links to Run For Your Lives have been removed on 2013-02-20 when they announced that they are moving the date to November … apparently this is the second time that they have done this in Nashville. I’ll know more as we get closer to April. I just may make it. Sounds like fun! @Ryan, I hope you do. At least you can prep for it.